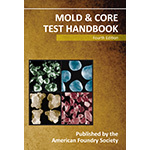 The American Foundry Society has long been committed to creating and maintaining procedures for mold and core testing. This updated version of the AFS Mold and Core Test Handbook is the direct result of dedicated foundry sand control testing and research that dates back to 1921. It is the product of the faithful and purposeful work of AFS Division 4 Molding Methods & Materials Division committee members. The test procedures contained in this handbook describe the latest accepted methods for testing foundry sands. These tests and methodologies are the metalcasting industry standards for sand testing and evaluation. Used by foundries around the world, these protocols provide a strong benchmark for operating foundries to measure mold and core effectiveness. Keywords: Sand, mold, core, binder, clay, permeability, strength, tensile.